There is a decision to be made in indie movies, especially science fiction films. On a limited budget do you try and get as much on the screen as you can or is it better to cherry pick what you show and make that as good as you can afford? For the most part the latter course seems to bring the greater rewards for an audience. 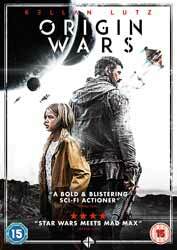 Thankfully, Origin Wars (2016. 1 hr, 35 min, 06 sec) directed by Shane Abbess, who co-wrote the script with Brian Cachia, has gone with the idea of writing a solid story with just enough special effects to sell it. We find ourselves in the far future where mankind has colonised many planets, how and why are not explored as they are extraneous to the main narrative. One of our main protagonists, Lt. Kane Sommerville (Daniel MacPherson) has moved with his daughter to his new posting. The corporation overseeing the planet is up to no good, breeding experimental creatures from the inmates of the planetary prison. Things, as they are wont to do, get out of hand and some of the creatures escape. Unwilling to own up, the corporation decide to overload the facilities nuclear reactor, thereby destroying all the evidence. This does not sit well with Sommerville as it will wipe out the nearby city, including his daughter. After a daring escape Sommerville crashes on the planet only to be met by Sy Lombrok (Kellan Lutz), who introduces himself as a nurse and the two set off to find the daughter and make it to safety, a shielded bunker whose location is only known to Sommerville. Unknown to both, the creatures are out and on the hunt. The people they meet are downright helpful; especially a couple of stoners who just happen to own an armoured vehicle. Even the gun runners are not particularly dislikable. There is no reason why the film requires such distractions and the main thrust is the journey to find and rescue the little girl and the narrative keeps the film's focus on this goal. The film does have one peculiarity in that the narrative is split into chapters and the chapters are not in chronological order. I found this an effective way of telling the story, otherwise when Sommerviille meets Cy we would already know too much about his past. The slow unravelling of both Cy’s past and the company’s complicity in the creation of the creature’s in this manner did not make the film any harder to follow. What money they did have has been spent well and the dogfight that Sommerville has to go through to get to the planet was especially well done. Once down the film relies mainly on practical effects, which includes the creatures. Their design is surprisingly effective, even if they reminded me of The Dark Crystal (1982) in a good way. They proved less effective in an attack scene and more so in that last section of the film where they can be seen close up. The film brings little that is wholly original to the genre, but what it does, it does well and for an indie film their sensible marshalling of the finances has ended up with a movie which looks like it could have cost twice as much and a cast that brings a level of realism to their characters. The disc comes with subtitles and only a single extra, an interview with director, Shane Abbess (8 min, 56 sec) which among other things addresses why the narrative was told in a non linear manner.